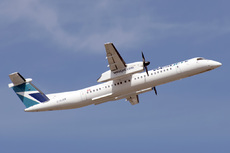 The DHC-8-402, operated by WestJet Encore as flight WS3161, was on a daylight instrument flight rules (IFR) flight from Vancouver International Airport (CYVR), Canada to Nanaimo Airport (CYCD), with 2 pilots, 2 cabin crew members, and 56 passengers on board. The aircraft departed CYVR at approximately 12:19 with the first officer as the pilot flying and the captain as the pilot monitoring. At about 12:30, while at 2000 feet above sea level, in visual meteorological conditions, on approach to CYCD, the flight crew noticed smoke in the cockpit. Shortly afterward, a cabin attendant notified them that there was smoke in the cabin. The flight crew immediately followed the company's DHC-8-400 Quick Reference Handbook (QRH) "Fuselage Fire or Smoke" procedures, which included donning their oxygen masks, declaring an emergency with Air Traffic Services, and continuing the approach to CYCD. At 12:35, the aircraft landed on runway 16 and came to a stop on the runway adjacent to taxiway B, with ground emergency vehicles already positioned nearby. Some smoke was visible outside the aircraft near the left engine, but it dissipated quickly, and there was no sign of fire. No extinguishing agent was used by ground crews at the scene. The passengers and cabin crew evacuated the aircraft onto the runway in 62 seconds. The pilots deplaned shortly afterward. There were no reported injuries. Runway 16/34 was closed for 1 hour while Nanaimo Airport staff and WestJet staff escorted the passengers and crew to the terminal, conducted a runway foreign-object check, and towed the aircraft onto the apron. The outboard side of the left engine nacelle had a significant quantity of oil on it, originating primarily from the P2.2 (interstage bleed valve) vent in the engine cowl. Oil was also observed in the engine air-intake plenum and on the chin cowl immediately above the air intake. An engine inspection revealed that a steel spring (wave washer) in the 2.5 bearing carbon seal had disintegrated, compromising the efficiency of the carbon seal. That deficiency had in turn allowed turbine oil to leak past the carbon seal and enter the compressor airstream and the cabin pressurization system.